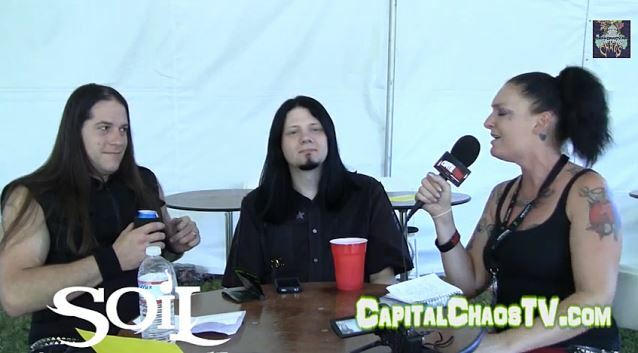 On September 15, Amb Pirate of Capital Chaos TV conducted an interview with with Adam Zadel and Tim King of SOIL at the Aftershock festival at Discovery Park in Sacramento, California. You can now watch the chat below. SOIL's sixth studio album, "Whole", was released on August 20 via Pavement Entertainment. It's the band's first 100% independent release. "Whole" is the first SOIL album with original frontman Ryan McCombs since 2004's "Re.De.Fine" (after which he joined DROWNING POOL). It sees SOIL returning to its classic sound that fans have come to admire, with a pres release calling it the CD "that could have come directly after the 'Scars' album in 2001." Following the 2012 release of its first-ever live DVD, "Re-LIVE-ing The Scars", SOIL began writing new material and entered the studio in February 2013 with producer Ulrich Wild (PANTERA, BREAKING BENJAMIN) to begin recording. "This was by far the most comfortable and natural recording process we have ever experienced," says guitarist Adam Zadel. "From the writing, pre-production, and through the main tracking and mixing, everything was smooth and fluid." Songs featured on "Whole" include "Loaded Gun" and "Way Gone". Another track, "Amalgamation", sees McCombs taking songtitles from both the SOIL and DROWNING POOL releases he was a part of and weaving them into verses of the song. "I think, lyrically speaking, those that are familiar with the work I've done are going to get the next chapter that they would expect," McCombs says about the lyrical process. "Words from a heart and mind that has lived them. "One of the greatest things I experience as a lyricist is when people come up and share with me how a song, or a specific verse or line from a song, got them through a hard time or times in their lives. It reminds me of the times music did that for me and how powerful music and/or a lyric can be in a person's life." Drums and percussion on "Whole" were performed by Will Hunt (BLACK LABEL SOCIETY, EVANESCENCE, DEVICE). "Will added a whole new dimension to the songs," states King. "He added a monstrous and aggressive vibe to the album." A guest guitar solo on "Wake Up" was performed by longtime friend Mike Mushok of the band STAIND.